Our uPVC conservatories are available in a wide range of attractive styles. From the traditional Victorian conservatory to the simple and modern design of the Lean-to, we have conservatories for every property type. Extend your home with a beautiful conservatory from Starglaze. Our stylish range of conservatories include both modern and traditional designs so you can benefit from a striking style no matter your property type. Our stunning conservatories are available to customers in Lincoln, Nottingham, Newark and surrounding areas, and will bring your family a beautiful new space to enjoy all year round. Our expert team are with you every step of the way, from initial design to survey, we offer a complete service to ensure your finished conservatory is the perfect addition to your property. All of our conservatories are designed to match both home and lifestyle so we take great care in making sure your conservatory is a high valued extension. Our conservatory experts will make sure your conservatory complements your property’s existing brickwork and blends seamlessly with your home. Working with our knowledgeable team takes the stress out of choosing a conservatory style and design. You can rely on their credentials and years of experience to help you choose the best conservatory for your property. One of the questions we pose to our customers is, what will you use your conservatory for? For many, a conservatory is a means to create extra space within their homes but for others, a conservatory is merely a place for comfort and relaxation. This is the first step in choosing the right conservatory for your lifestyle as well as home. We understand every homeowner’s needs are different which is why we work with you to create a conservatory that not only meets your property requirements but also your home lifestyle. Starglaze gives you style, comfort and fantastic peace of mind in a conservatory design that is exclusively yours. Choose from an attractive range of conservatory styles including bespoke designs completely tailored for you. The classic and timeless elegance of the Victorian means it makes the perfect addition to period properties as well as modern homes wanting a touch of the traditional. In fact, the Victorian conservatory is highly versatile and can be extended to a wide range of properties. The Victorian conservatory style is mostly recognisable by its multi-faceted design. This traditional conservatory has soft, rounded facets – similar to an octagon. Victorian conservatories feature distinctive cresting along their roofs, imitating the charming architecture that was inspired during the Victorian era. Beautiful finials line the roof, adding a rather glamorous touch. The Edwardian conservatory design is suitable for most types of property and is a popular choice of style due to its spacious interior – a particularly attractive benefit for home owners looking to maximise space. This conservatory will add a touch of elegance to any home. The Edwardian’s classic structure is complemented by crisp clean lines, making it beautifully understated. If you are looking for a more traditional style conservatory but one that offers more floor space then the Edwardian conservatory is the perfect choice. The lean-to conservatory or ‘sunlounge’ is our most popular and cost-effective option. 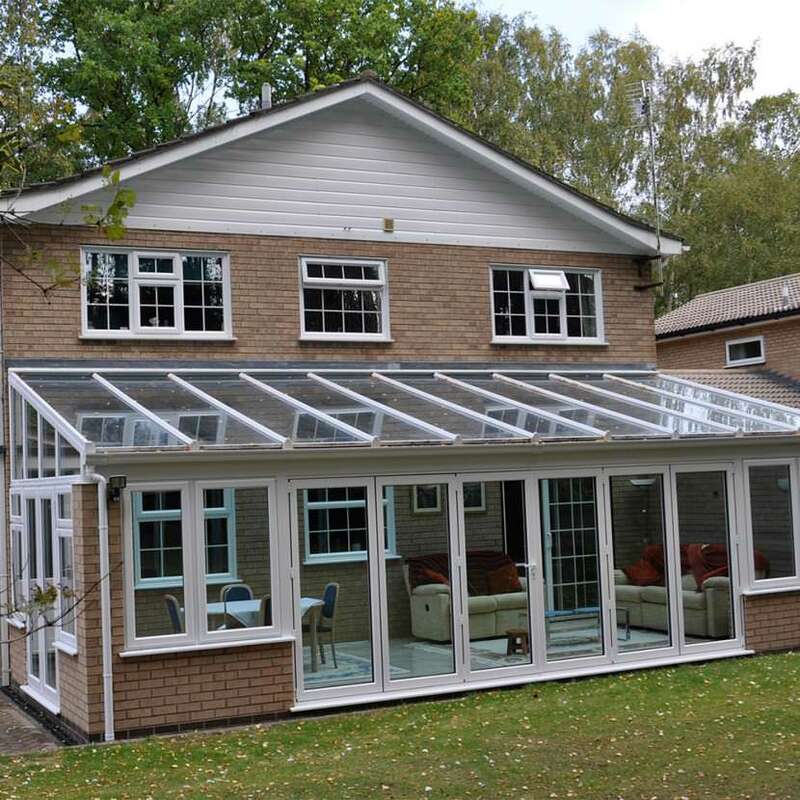 These practical and highly versatile conservatories can be adapted for any property. This style can be made to fit bungalows, terraced houses and any property with low eaves. A stylish and contemporary design, the lean-to conservatory is perfect for modern living. Simple in its structure, the lean-to is a very affordable conservatory, ideal for those on a budget. If the standard conservatory designs aren’t for you, then we can create a style unique to your specifications. Our conservatories are designed to suit your taste, budget as well as lifestyle and property. Our experienced designers and builders will work closely with you to ensure that together, we achieve a truly bespoke design and your dream conservatory. At Starglaze we offer a completely free and without obligation conservatory design service for anyone interested in our products or services. Our talented design consultants will meet with you to discuss your requirements and explore the options available to you. Our online quoting engine allows you to browse a wide range of conservatory styles and get instant costs. Whether you want a fully glazed or dwarf wall design, our clever online service will give you a unique conservatory quote.